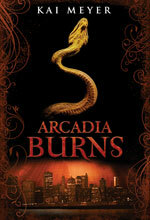 Arcadia Burns is an exciting and compulsive paranormal read. Although it has a romance at its heart, it also contains strong elements of suspense and mystery. The book is set in the mafia world and has overtones of Romeo and Juliet. It features lovers Rosa and Alessandro, heads of the rival Alcantara and Carnevare clans, who, as Arcadians, can shape shift, Rosa into a snake and Alessandro into a panther. The novel is the second in a trilogy by author Kai Meyer, the first being Arcadia Awakens and the third, Arcadia Falls, scheduled for 2014. Although I have not read the first, I had little difficulty in picking up the plot as the history of the characters is cleverly woven into the early chapters. Rosa has unexpectedly become head of the Alcantara clan, after the murder of her sister and her aunt, and is trying to get to grips with the position. She departs for New York in search of answers to events that happened in book 1. Whilst there, she encounters the American branch of the Carnevares. Rosa barely escapes with her life, in one of the most nail biting and gory scenes in the book. We are left in no doubt as to how the animal instincts of the Arcadians come to the fore when they have shifted from their human form. Rosa is also reunited with her mother and some truths about her family are revealed. Revelations about the horrifying experience she was subjected to in book 1 are also made, before she returns to Sicily and Alessandro. There are many who wish to undermine their relationship, and the influence of unforeseen forces and a mysterious and ancient organisation hovers in the background. The plot is full of secrets, mystery and intrigue and ever present danger, with the only constants being Rosa and Alessandro’s love. We also learn more about the ancient history of the Arcadians. There is much betrayal and bloodshed ahead before the gripping and action-packed conclusion. At the heart of the novel is the romance. Rosa and Alessandro both struggle to head their respective clans, without letting centuries of hatred and mistrust between their forebears tear them apart. Rosa matures quickly as she strives to end some of the Alcantara’s more shady, albeit profitable, business dealings. She has also had to adapt to learning that she is part of a shape shifting dynasty that can change into a snake. In this novel Rosa tries to come to terms with the events that happened to her in New York, of which she has no memory, but which are key to the plot development. Alessandro is a truly likeable hero and it is easy to understand why Rosa is so enamoured of him. Although he withholds some secrets, I feel that he does so with Rosa’s interests at heart, as he is both loving and protective, whilst still respecting her independence. Secondary characters include Trevini, the Alcantara family lawyer, and Iole, who appeared in the first book. Others that were pivotal in the events in book 1 also make an appearance. The grim reality of prior events are slowly revealed, as are enemies out to destroy both Rosa and Alessandro. The secrets which are revealed from those now departed from this world are as shocking as those kept by the living. I was kept in suspense throughout and I could not anticipate the next plot twist or the exciting conclusion. I liked the author’s writing style. The book has a complex plot, with strong characters and evocative descriptions. I particularly liked the descriptions of New York early on in the book, as well as Sicily, the setting for most of the scenes. I was compelled to read the book to have all of the questions raised within the plot answered and I was also hoping for a HEA for Rosa and Alessandro. I think it is very brave of the author to tackle so many emotive and difficult issues in a book aimed at younger readers. It is done in way which is sensitive yet not in any way patronising, recognising that young people, as well as adults, wish to explore challenging issues in the safety of a fictional environment. Although the book worked very well for me as a stand alone, I would also like to read the first instalment to fully appreciate the back story of all the characters involved. I recommend the book to young adults and adults. I would definitely like to read more from this author and I am looking forward to reading the conclusion of this trilogy. This book was given to me by the publishers, Templar Publishing, for the purpose of an honest review. Click her for my colleague Caroline’s review of Arcadia Burns.